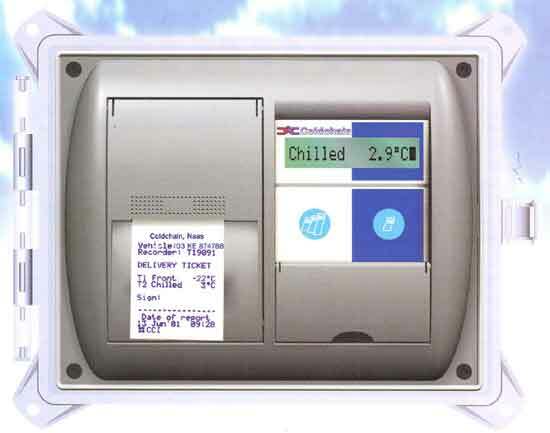 The SENTINEL temperture recording system has been designed to meet the demands of the small vehicle/home delivery sector of the refrigerated vehicle market. Cost effective replacement for mechanical chart recorders. Delivery ticket or journey ticket printouts at the push of a button. 2 temperture inputs and 1 on/off input (door or defrost). User selectable recording interval of 5, 15 or 30 minutes. Simple offload of recorded data via fasia socket (RS232 port) for storage and analysis on a standard office PC using TSxpress PC software. Optional RS232 port for connection to on-board computer system for vehicle tracking and location applications. Security protected clock with automatic Winter / Summer adjustment. Same size paper roll for all versions (T', R' and C').